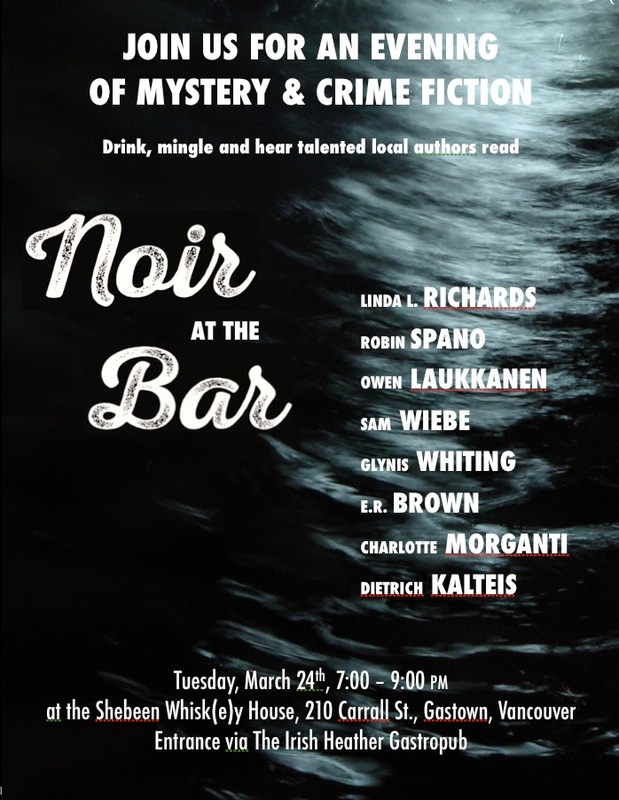 Detectives Beyond Borders: What's so great about Noir at the Bar? Nice photos, Peter! Especially the second. 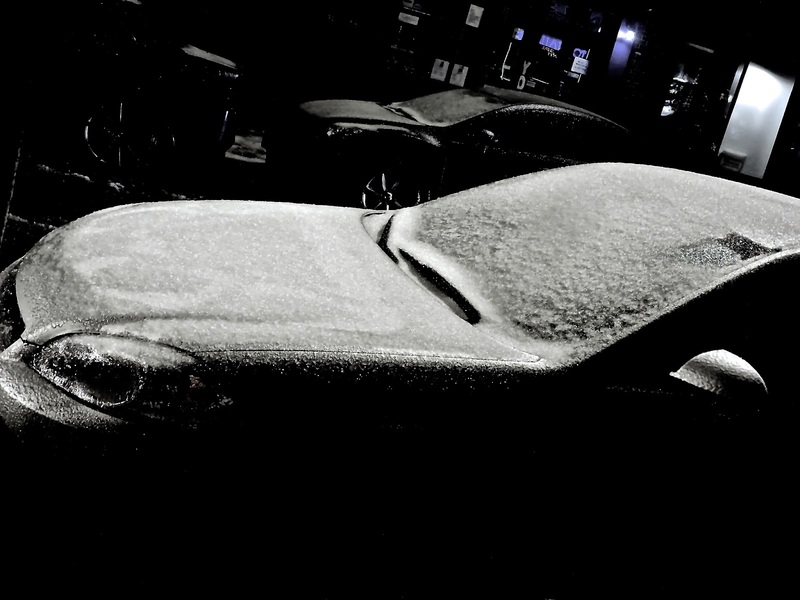 Your noir photos of ice-glazed streets and cars remind me of why I abandoned living in the north in favor of suffering through winters on the U.S. Gulf coast. And this reminds me: much noir includes settings up north and out west and overseas, but I wonder about noir for the south. Perhaps it is time for me to embark on a reading frenzy focusing on Southern noir novels/stories. Point me in the right direction of authors and titles. Daniel Woodrell has been described to me as writing Southern noir, RTD.Although I haven't read him yet, having seen the movie they made out of Winter's Bone, I'd be inclined to agree. Thanks, Seanna. Of course, any Southern noir probably stands in the shadow of Southern gothic -- Faulkner, O'Connor, and others. Still, I am suddenly intrigued, and I am on the trail of Southern noir (assuming such a species exists). And yes, RTD, I imagine there would be a Gothic influence on most of them at this stage of the game. Thanks, Krauss. I recently have been out and about with my camera around sunset, a time when I am almost never outside. It's a whole new world as the sun goes down. RTD, a bunch of noir and hard-boiled writers have set stories in South. RTD, you might find this article helpful. 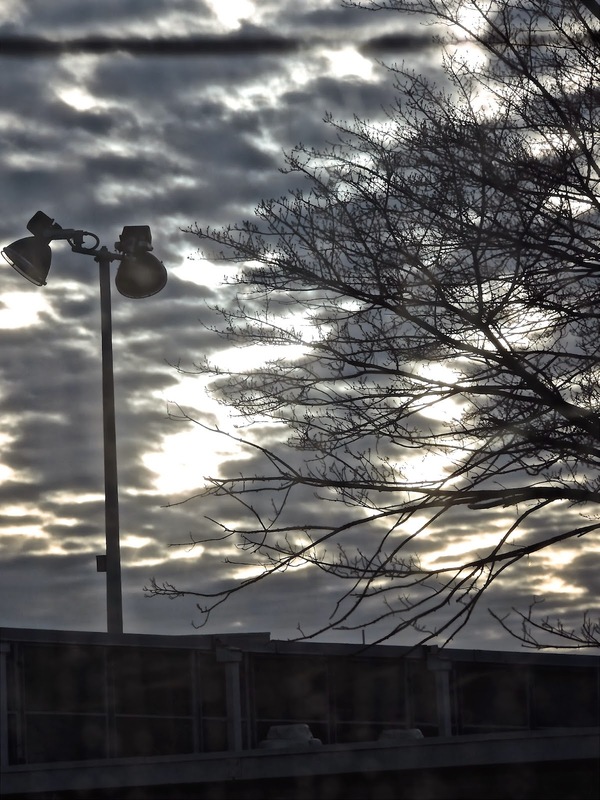 And many of the photographic effects I like best are signs of the coming spring, really: slush is nothing but ice melting in the warmth of the coming spring. So when you think of dark, dirty slush, you should really be thinking of songbirds chirping. Seana, Daniel Woodrell is a fine choice. You, RTD, or both might also try Jim Thompson's Pop. 1280, his best book and one of the great crime novels. Seana, the closest Noirs at the Bar I know of to the South have happened in Texas. Florida has a bunch of noir writers, including Jonathan Woods and the excellent Vicki Hendricks, and I have heard of crime fiction festivals held there. I don't know about Noir at the Bar though. Incidentally, three of the next four Bouchercons will happen in the South: Raleigh, N.C.; New Orleans; and St. Petersburg; with a break for Toronto in 2017. I like that photo of the rain in the car headlights. I recommend - again - the book Edgelands by Paul Farley and Michael Symmons Roberts in which they talk about the beauty of rain on asphalt, abandoned car parks, slushy side streets, sewage plants, ruined canals, wasteground etc. There are no photos but there is some good poetry. I've looked for that book based on your recommendation and will do do again. And I can supply the photos. 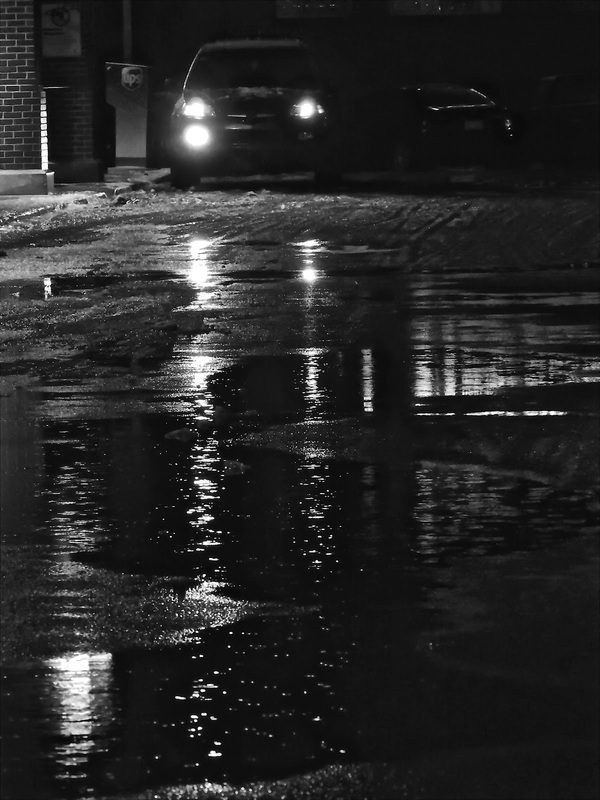 Rain, puddles, slush, and ice are my artistic making as a photographer. That car picture is my favorite, too. Cover shot for Stark House? I bought "Edgleands" based on Adrian's recommendation (haven't been able to read it yet) and I would love to read at a Noir at the Bar. Ain't gonna happen in northern New Hampshire, though, I'm pretty sure. Rick: You could dragoon Canadian ex-pats on their wat to Montreal to buy bagels into reading at a N.H. Noir at the Bar. And Noirs at the Bar have been organized at the last three Bouchercons, so maybe someone will do it in Raleigh as well. Thanks for the kind words on the car shot. I have more shots you might like, which I'll post here from time to time. (One in particular might be well-suited to a novel set in the shinier districts of a large city.) I also post lots of photos on Facebook in my "time line" and "noir photo" folders.